LAUTERBACH has extended the list of supported controllers from Infineon Technology. The support for the C166 CBC and the C166S V1 has been available since 1998. Its TRACE32-ICD and TRACE32-PowerTools now support the XC161CJ as the first derivative from the C166S V2 family. Available from Electro Optics , the TRACE32-ICD in-circuit debugger and also the new TRACE32-PowerTools now support the Infineon C166S V2 processor family, the XC161CJ. This allows user-friendly debugging at C or C++ level via the on-chip debug interface. Modules with parallel, USB and Ethernet interface are available. Debugging at HLL and assembler level, an unlimited number of software breakpoints, batch processing, access to internal memory and register during run time and utilisation of the on-chip break logic. The internal and/or the external FLASH memory of the controller can also be programmed via the OCDS Level 1 interface. A download speed in excess of 500 kB/s is available with the TRACE32-PowerTrace Ethernet. The TRACE32-FIRE emulator using a bondout is also available. This offers a trace recording and real-time access to all on-chip busses, performance analysis, code coverage analysis, statistics functions, time diagram of the TRACE data and RTOS support. 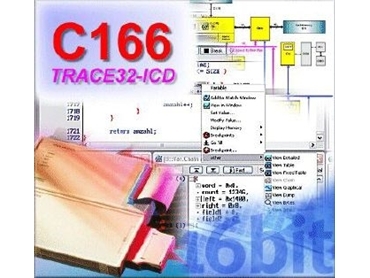 Using a common Debug IDE enables users to standardise their tools with either the TRACE32-ICD's or TRACE32-FIRE emulators for the C166 CBC and C166S V1 processors. By simply changing out a base module, support is also available for other well known families including processors from Motorola, Hitachi, Arm and many more.